Health Benefits of consuming Almonds !! We all love crunching on almonds, don’t we? They can be eaten like a snack, or when you’re bored or if you’re trying to look cool by popping them into your mouth. They also sort of seem to have a pleasing flavor that can’t really be compared with anything else. And we somehow mistook almonds for being a particular type of nut, they really are not. Almonds are actually seeds and are specifically called a drupe. Almonds can be eaten either raw or toasted and no matter how you do eat them you’re just not going to stop after one. Even better, these seeds are filled with vitamins, minerals, proteins, and fiber. You have a good reason to spoil yourself on eating almonds now. But seriously, don’t !! Eating only a handful of them would be the wiser thing to do. You probably heard about facts stating how eating almonds could help people in losing weight. But did you know that consuming almonds could have other health benefits as well? If you don’t, we’ll do the part of updating your knowledge regarding how almond consumption can help you. Here are some of the health benefits almonds can provide. Take a look !! Almonds can decrease the risk of heart disease !! Researchers have found that they significantly increase the amount of antioxidants in the bloodstream which has the ability to reduce blood pressure and improve blood flow. They had higher levels of antioxidants (alphatocopherol) in their blood stream. The individuals had improved blood flow and lower pressure. Almond consumption also decreased the risks of heart disease. Almonds are known to contain a range of beneficial substances such as vitamin E & healthy fats. It has fiber which can give an individual the feeling of fullness. It also has flavonoids which include antioxidant properties. Adding a handful of almonds(approx 50g) every day for a certain period will help. A daytime snack can be replaced with a bag of almonds. Adding almonds to your regular meals like porridge or musseli can help decrease the risk of health problems. Due to the benefits almond has to provide, along with the benefit of keeping your heart healthy, almond is considered a superfood. The study was carried out by Professor Helen Griffiths, a Professor in Biomedical Sciences and Executive Dean of the School of Life and Health Sciences at Aston University in Birmingham, UK. Almonds may help boost cholesterol level !! Almonds may help boost healthy cholesterol levels !! Almonds may help boost cholesterol level !! Researchers have found that consuming almonds on a regular basis may help boost levels of HDL cholesterol and simultaneously improved the way it discarded cholesterol from the body. Previous researches showed that a diet that included almonds reduced low-density lipoprotein or LDL cholesterol which is considered a major factor for heart disease. HDL or high-density cholesterol, on the other hand, is considered as good cholesterol and can actually help lower the risk of heart disease. HDLs are usually small when it gets released into circulation but expands gradually and slowly, becoming more spherical in shape. It gathers cholesterol from cells and tissues before depositing them in the liver to be broken down. And depending on how much cholesterol it has collected, HDL cholesterol is usually categorized into 5 sub-populations ranging from very small preβ-1 to the larger more mature α-1. They conducted a study in which 48 men and women with elevated LDL cholesterol levels participated in 2 six week diet periods. In both the groups, their diets were identical, except for the daily snack. The almond diet group were given a handful of almonds a day. Whereas the other group was given a banana muffin instead. The almond diet increased preβ-1 HDL levels, where the particles are at their largest size and most mature stage by 19 %. The almond diet improved HDL function by 6.4 % in individuals who had a normal weight. What is actually happening in this process? Consuming almonds helped create larger particles when compared to not consuming almonds. In simpler words, the smaller particles are getting a kick start by going to tissues and pulling out the cholesterol and getting bigger. Finally, all that collected cholesterol is taken to the liver for being removed from the body. According to a researcher, an increase in this particular HDL level is useful as the particles seem to be able to decrease the overall risk of cardiovascular disease. Along with their heart-healthy benefits, almonds can also provide a dosage of good fats, Vitamin E and Fibre. The study was carried out by a team of researchers from Penn State !! Almonds may boost nutrients in diet !! A research stud found that consuming a moderate amount of almonds each day may enrich the diets of both adults and their young kids. Almonds are considered a good source of plant protein, especially fatty acids, vitamin E and magnesium. A study was carried out in which nutrition scientists gave almonds regularly to 29 pairs of parents and children. Most of the adults were mothers with an average age of 35 while their children were aged from 3-6 years old. The children were encouraged to consume 0.5 ounces of almond butter regularly while the parents were given 1.5 ounces of almonds each day. 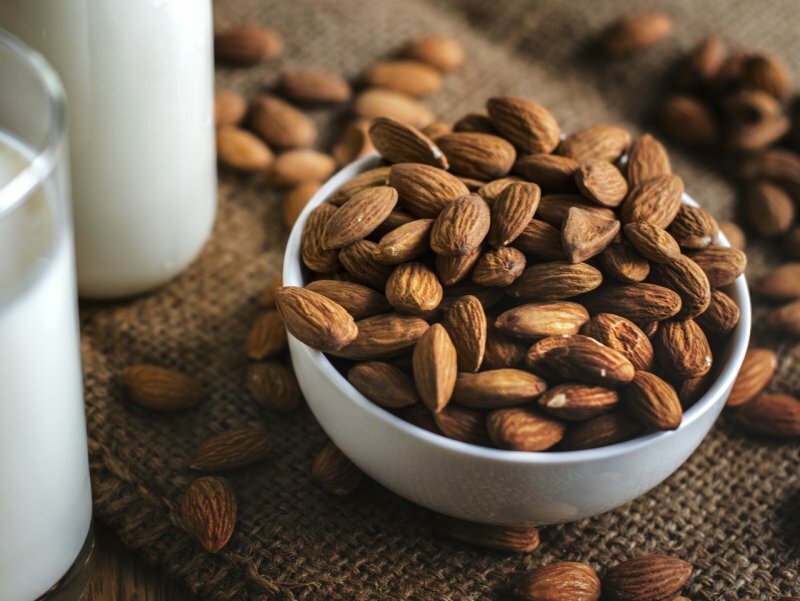 Participants ate the almonds for a few weeks and then resumed back to eating their typical intake which comprised of other food items and snacks. Researchers then analyzed the results of the participant’s improved dietary consumption by using the Healthy Eating Index (HEI), a tool used to measure diet quality. They also used an online dietary recall to find out what adults had eaten and how much. Their HEI increased for total protein foods seafood and plant proteins and fatty acids while they ate fewer calories. Parents also reduced their sodium intake. Parents and kids consumed more vitamin E and magnesium when they ate almonds. The study was carried out by Alyssa Burns, from the UF/IFAS food science and human nutrition department.